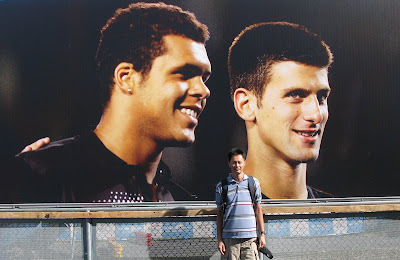 On a roll and seems unstoppable, currently holding three of the four slam crowns. A devastating loss in the final in a match he could and should have won. 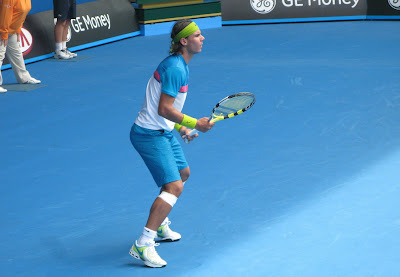 Nadal certainly has his number and it's going to be tough for Roger to get Sampras'. What can you say? Serena can usually turn it on when the going gets tough and she certainly did this year. Admittedly women's tennis doesn't have a superstar at the moment with a host of mediorce players in the top 10. Watching Safina play is pretty much like watching her brother play. She has that female Russian serve, most going into the net. She's also shed some pounds and does have a great game though. Hopefully she can get her head together and win the big ones. I'm certainly rooting for her. Two weeks of Hot Hot tennis. 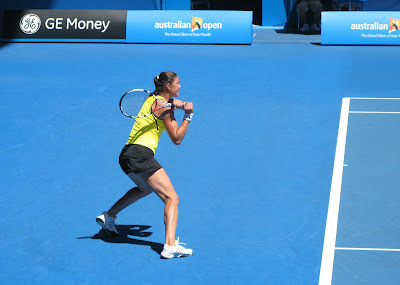 The Australian Open is our favorite tournament. This year marked our fifth year at the tournament in the last ten years. Australia is a great place for Americans to visit especially when it's winter back home. It's January and summer down under. Unfortunately this year the weather turned HOT. The hottest week on record with temperatures soaring towards the mid-forties (centigrade) for almost a week. 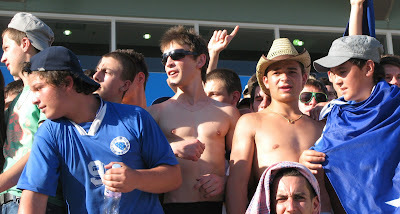 The players didn't like it and the fans, especially those sitting in the sun, didn't like it. Attendance the second week dropped off significantly during the day sessions. Many fans just didn't want to make the hot trip to the tournament just to sit in the heat. The massive heat wave had also buckled rail lines and brought transit systems to a standstill with massive power outages cutting electricity to twenty percent of the city. It seemed tournament officials didn't know how to handle the heat. There is a heat rule in effect but it had been altered from years past. 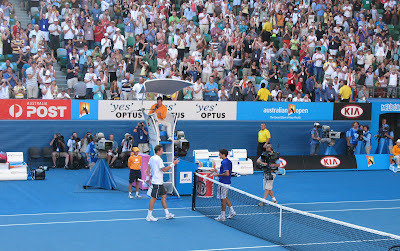 The roof over Rod Laver arena remained open when the mercury rose beyond comfort. Players complained more and began dropping like flies. On one of our day sessions the first two matches ended in retirements. 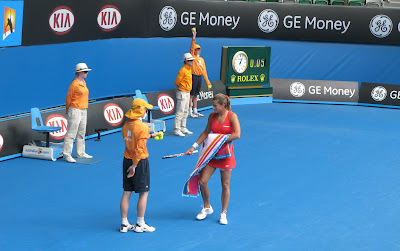 Finally organizers decided to close the roof after Serena Williams had dropped the first set against Kusnetsova. 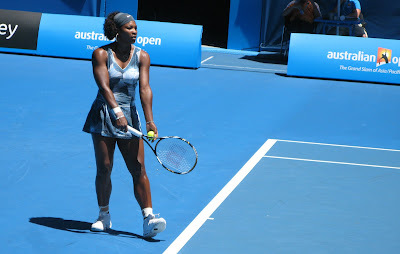 Serena went on to win the match and Kusnetsova was rightfully upset since she felt the altered conditions favored Serena. 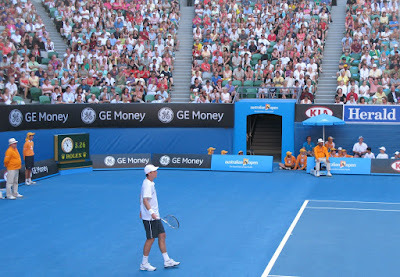 Tournament officials had finally felt the heat, even from Rod Laver himself who questioned why the roof over the stadium named after him remained wide open in the stifling heat. 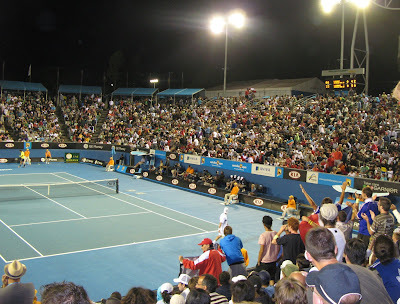 Night matches the first week on Margaret Court Arena. Always a great atmosphere and some exciting matches. 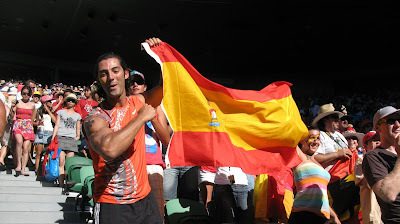 Rafa's fans. Always there and usually happy. 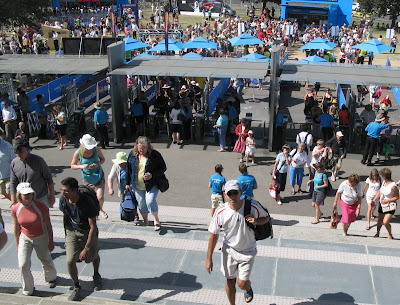 What makes the Australian Open fun are the crowds. 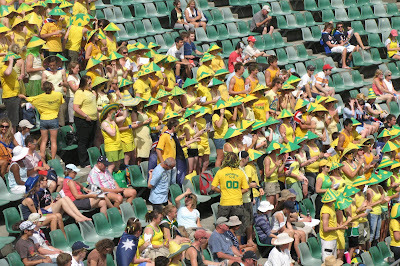 Yes, the tennis is good but it's summertime down under and school is out. 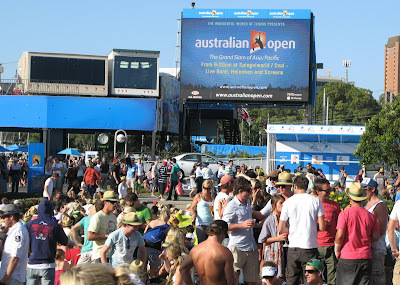 There is much talk of moving the Australian Open to February or March. 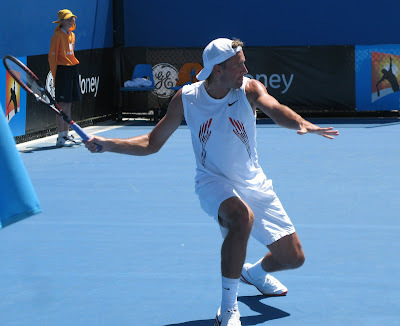 All the top players want it but there is much resistance from Tennis Australia. 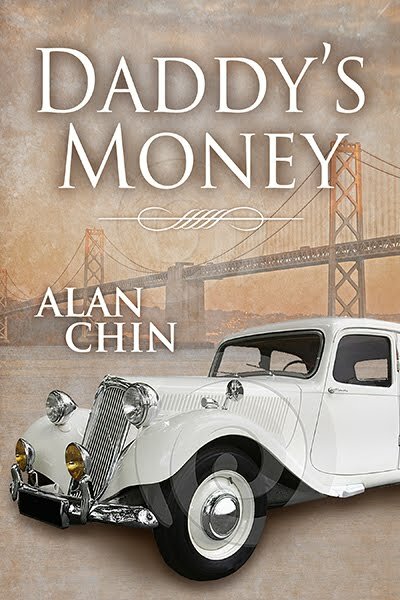 The main reason of course is money. School would be back in session in February and organizers feel it would cut into their take. But the players do have a valid point. Mid-January for the first slam of the year leaves little time after the off season for them to prepare. Maybe the heatwave this year will spark a change of date for the tournament. 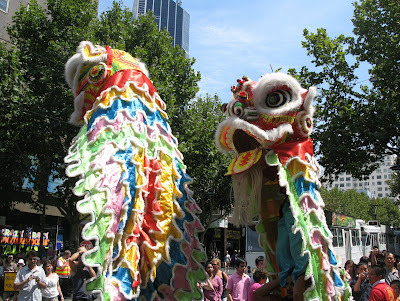 Chinese New Year is being celebrated around the world and we're celebrating this year in Melbourne, Australia. It falls on January 26 this year which just happens to be Australia Day (Australia's Fourth of July). 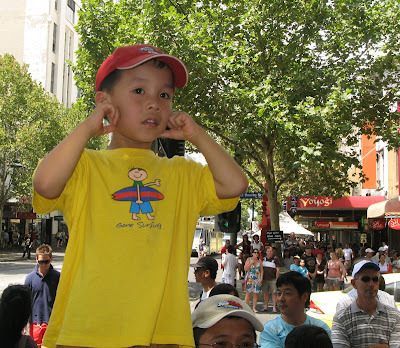 There's a healthy Chinese population here in Melbourne, perhaps even more than there is in Sydney, but probably just less diluted than in Sydney. 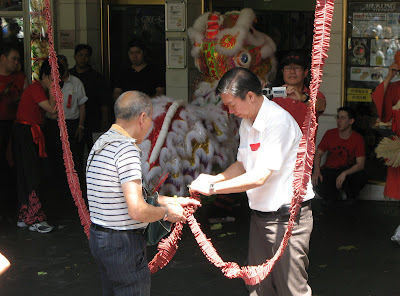 In any case, the organizers didn't hold back on any of the celebrations as a full slate of activities and day of partying shut down most of the streets in and around Chinatown. 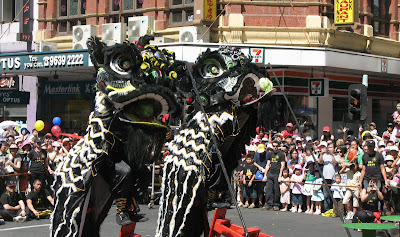 There were at least a half dozen Lion Dance troupes making their way through Chinatown helping the merchants beckon in the new year with prosperity and good luck. 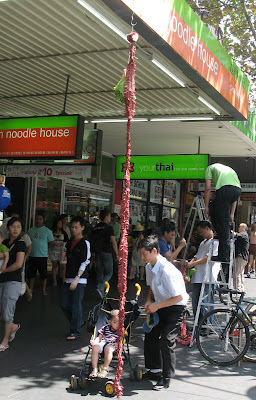 Many shopkeepers simply hung out some lettuce in their entryway and waited for the lions to show up. 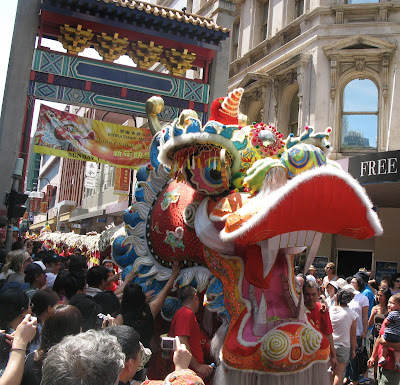 What's a Chinese New Year parade without a dragon? 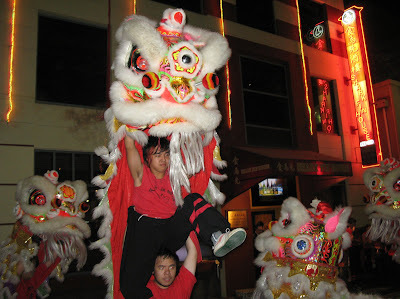 Where there are Lion Dancers there are usually firecrackers and they weren't shy about lighting them up. 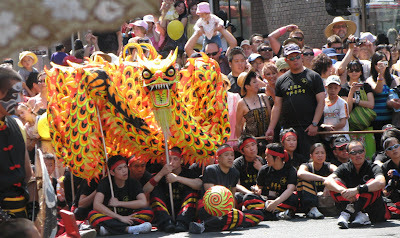 Many of the merchants had strings, twenty feet long, strung out waiting for the lions. Welcome Year of the OX. Yes, if you were born in 1925, 1937, 1949, 1961, 1973, 1985, 1997, or 2009, you're an OX. People born in the Year of the Ox are patient, speak little, and inspire confidence in others. They tend, however, to be eccentric, and bigoted, and they anger easily. They have fierce tempers and although they speak little, when they do they are quite eloquent. Ox people are mentally and physically alert. 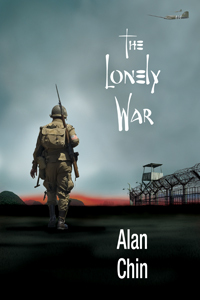 Generally easy-going, they can be remarkably stubborn, and they hate to fail or be opposed. They are most compatible with Snake, Rooster, and Rat people.